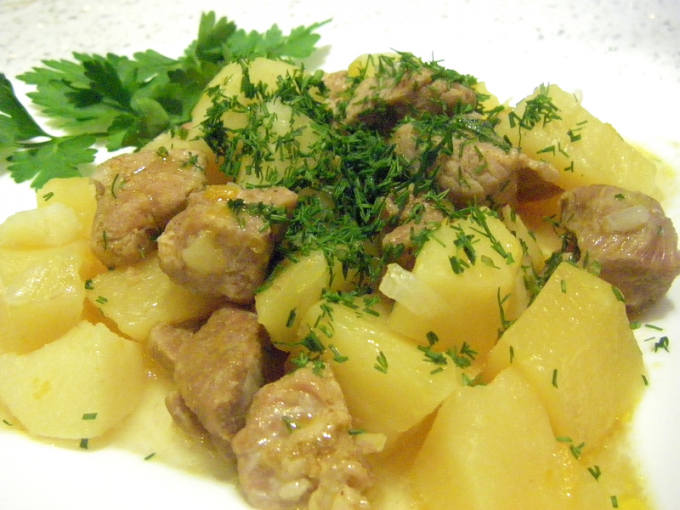 Potatoes and meat is all you need for a hearty lunch. Extinguish these products in a pot with spices, and you get a great dish that will easily feed an entire family. - 1.5 tsp. of salt. Wash the potatoes, peel it and cut into large slices, cubes or circles. Will rascality vegetable oil in a pot and fry the sliced vegetables on high heat until the appearance of brown 3-5 minutes. Put it in a deep dish, sprinkle with half of the salt and gently stir with a wooden spoon or spatula. Cut the lamb cubes, also fry them until it will turn brown, put and season with the remaining salt, cumin and ground black pepper. Put on the bottom of the cauldron in the remaining oil, the potatoes, top coat it with meat, pour in half a Cup of hot water and close the pot with a lid. Allow the liquid to boil at a maximum temperature, then reduce it to low and simmer the dish for 35-40 minutes. Spread in a deep dish and sprinkle fresh herbs. Cut pork into pieces of medium size. Clean the onions from the husk and finely slice, grate the carrot on a coarse grater. Cut the peel from the potatoes and soak them in cold water, not to be darkened, while you are doing other ingredients. Pour vegetable oil in a cauldron and heat it to a gentle crackling. Fry carrots until Golden brown, then stir in onions. Fry the vegetables while stirring continuously to prevent burning, for 3-5 minutes. Dip the meat in a bowl, pour 1 tbsp. of hot water and simmer on low heat for about half an hour. If the liquid boils away before their time, two more, not forgetting to boil it first. Lay the potatoes over the impending pork, salt and stir well. Add 1 tbsp. hot water. Throw into the cauldron coarsely chopped garlic cloves, Bay leaves and peppercorns. Close the lid and cook everything for another 30 minutes, until the potatoes are soft and will easily slide off a fork. For greater saturation of flavor for 5-7 minutes before end of cooking you can add 150 ml of sour cream or 60 g of tomato paste to make a thick flavorful sauce.